You have probably already used your outdoor fireplace ​for roasting marshmallows and delicious s'mores, but did you know that you can also use it to prepare a feast for your friends? In fact, almost any meal that can be made on a regular grill can be cooked on your fire ​bowl. Since most fire pits are larger than bbq grills, it is extremely easy to cook enough food to feed several hearty appetites. With the addition of a lid, you can even use it as a smoker. In fact, one of the hottest trends right now in grilling is using your garden fire pit to barbeque. 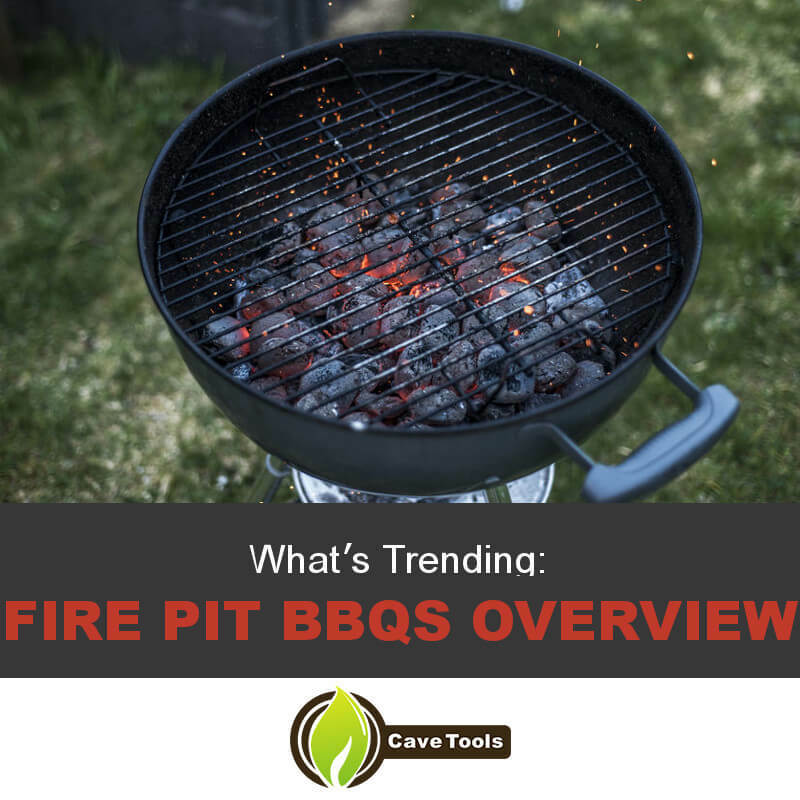 Stay up with the crowd who always wants to know what's trending with this fire pit barbecue overview. Backyard Fire Pit - You can grill over a variety of fire pits, like square fire pit or gas fire pit, but I prefer the round fire basket with its grilling grate. Its ash tray makes cleaning up after cooking a snap, and its steel frame covered with high-temperature paints makes it withstand cooking with a variety of types of logs. Wood - I prefer to cook over maple wood because it provides a subtly sweet flavor to the meat. You can also choose a fruit wood like apple or cherry if you want a stronger sweetness to your meat or a different hardwood like oak or mesquite if you want a more intense smokey flavor to the meat. Meat - My favorite meat to barbecue on a fire pit is chicken. You can, however, choose between many different types of meat including pork ribs, duck or sausage. While I love to do meat, you can also barbecue a variety of vegetables like corn, asparagus, green beans or bell peppers. Aluminum foil - You will need it to wrap up the ribs. Choose a heavy-duty variety. Oil - Rubbing the meat with oil helps the seasonings stick better. Dry rub - While I will tell you how to make your own dry rub below, you may want to buy a premade one at the store. The purpose of a dry rub is to lock in the meat's juices, help form a crust and increase the meat's flavor. Barbecue sauce - While there are many different types of barbecue sauce, my favorite is my own which I will also tell you how to make below. You need to use barbecue sauce as it helps to break down tough fibers, acts as a natural preservative and adds flavor. Apple Juice - You will need apple juice for basting the chicken. Make sure to use 100 percent apple juice. Pastry brush - Use a pastry brush for basting the chicken. Barbecue sauce - I prefer to make my own, but you can always use one from the grocery store. I always trim my chicken pieces before I cook them. Examine each piece to make sure that there are no little slivers of skin or meat that might cook too quickly and burn. Remove these with scissors or a sharp knife. While you can use many different types of dry rub on the chicken, my favorite is a simple combination of things that you may already have on hand. I simply combine 2 tablespoons kosher salt, 2 teaspoons black pepper, 2 teaspoons paprika, 1 teaspoon cayenne pepper, 1/2 teaspoon ground cumin, 1 teaspoon dried oregano leaves and 1 teaspoon garlic powder. Stir the mixture together in a small bowl. Pour some oil into a bowl and apply it all over the chicken. The amount that you need will depend on the amount of chicken that you are going to be cooking. The next step is to apply the dry rub to the chicken. 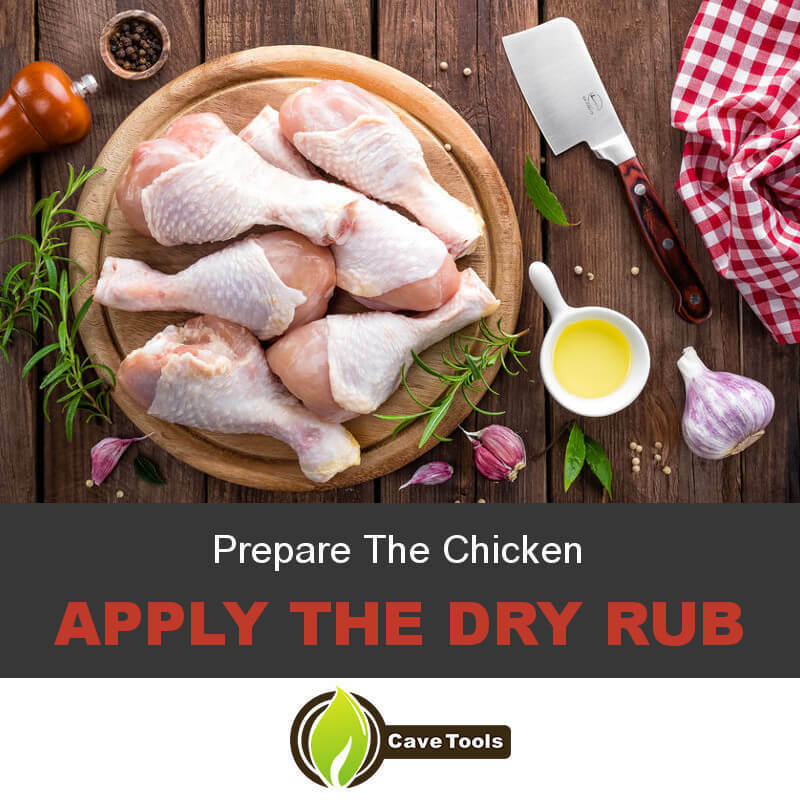 Use your hands to apply the dry rub on top of the oil. Pat the dry rub on as you go. Make sure to evenly cover all areas. Let the chicken sit in the refrigerator for at least two hours. It is better to let it sit overnight, but you may not be able to wait that long if friends show up and you need to feed a crowd. Your next step is to prepare your fire pit. While there are propane and electric fire pits, I prefer to use a wood-burning one. Start by choosing the tinder that you want to use. You may use dry pine needles, pieces of torn up newspaper or pieces of dry grass. Place slightly larger pieces in a teepee formation above the tender making sure that there is plenty of room for air to get through. Light the tender on fire and wait for the kindling to start burning well. Then, lay on your bigger pieces of dry wood. Go slow so that you do not smother the burning kindling. If the kindling starts to go out, then make sure to add more to your fire. Wait until you have a hotbed of ashes before moving on. Wash the grate. Then, use a paper towel to oil it. You should oil each section so that your chicken will not stick while you are cooking it. Once you have hot ashes, then place the grate on top of the fire pit. Now, you are ready to add the chicken to the fire pit. Place the largest pieces nearest the fire, and surround them with your smaller pieces. Never place the chicken directly over the fire. It will take about two hours to cook. Turn the pieces one-quarter turn every 15 minutes. Pour the apple juice into a container. Use a pastry brush to baste the chicken as you turn it. The amount of apple juice that you use will depend on the amount of chicken that you have, but figure on about one-fourth cup for eight pieces. You can easily make your own barbecue sauce right on top of your fire pit. Add 1 1/2 tablespoons olive oil to a skillet. Let the oil get hot, then add 1/4 cup finely diced onion and one teaspoon garlic powder. Cook the onions until they become soft stirring frequently. Stir in 5 tablespoons ketchup, 3 tablespoons brown sugar, 2 tablespoons apple cider vinegar, 1 tablespoon Worcestershire sauce and a dash of salt and pepper. Let the mixture cook for about five minutes. The next step is to baste the chicken with barbecue sauce. Use a clean pastry brush to apply the barbecue sauce to the meat while turning it so all sides are covered. 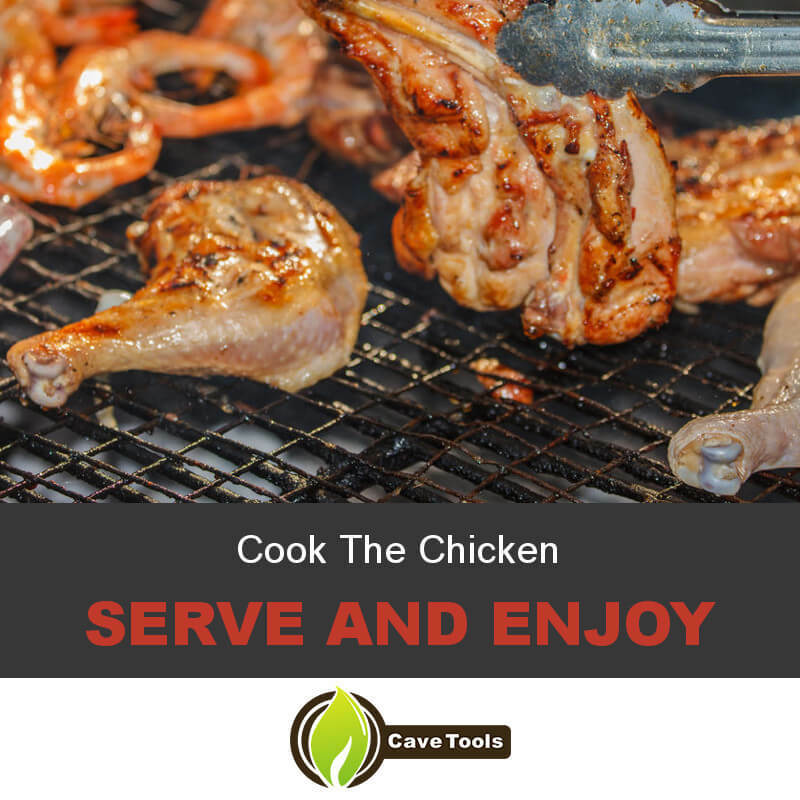 You will need to continue to add wood and cook the chicken until it reaches an internal temperature of 165 degrees. Be careful when measuring the temperature that you do not get the thermometer up against a bone as it will give false readings. You have now barbecued chicken right on your fire pit. Yell at everyone to come enjoy your wonderful creation. I hope you have enjoyed learning the latest trend of barbecuing on your outdoor fire pit. It's a great outdoor cooking activity to do on a summer night on your backyard patio, or as part of your camping trip. If you have tried making chicken or another food on your bbq & fire pit, then please share your experiences. We would love to hear about your experiences. Please share this article with your friends so that they can invite you over to their next barbecue on their fire pit. A fire pit is any structure created to contain a burning fire. You can build a fire pit yourself - it can be as rustic as a hole dug into the ground and surrounded by rocks, or it can be an elaborate metal or brick structure constructed by landscape professionals. While most wood fire pits use wood or charcoal as their combustion source, some round fire pits are fueled by natural gas or propane. Can you Barbecue on a Fire Pit? You can turn almost any metal fire pit into a barbecue grill with a few simple tools. If you add a grill grate, you can grill meats and vegetables the same way you would on a charcoal or gas bbq grill. The addition of a lid to the fire pit would trap smoke inside, effectively turning your fire pit into a smoker. Or, if you don’t have a grill large enough to fit your fire pit, you can use a rotisserie or a tripod. This will allow you to suspend foods over the fire. How Do You Start a BBQ Fire? Starting a fire in your fire pit is as easy as using the charcoal grill. The chimney starter is the fastest and easiest way to get your fire pit going. You can use different types of fuel, and if you’re using wood as your fuel source, it’s still beneficial to start the fire with charcoal. Simply load up the chimney, place newspapers at the base, and light the newspaper. Once the coals are red-hot, dump them into the fire pit and top them with your wood of choice. What Foods Can You Cook Over a Fire Pit? You can barbecue any foods in ​your yard outdoor fire pit that you would on a normal grill. Just like on a charcoal grill, it’s important to keep heat zones in mind. Building a two-zone fire (with an indirect heat and a direct heat side) is beneficial for many slower cooking items, like whole chicken or roasts. Can You Use Charcoal in a Fire Pit? Many homemade fire pits can burn charcoal with no problems, but some manufactured fire pits only recommend burning hardwood. Check with your manufacturer to see if it is safe to use charcoal.